At least, that’s what a new report, recently released by the Circle Economy social organisation, hopes for. In it, they focus they’re action in finding what they call “the circularity gap”, that part of the economy where the take and dispose occurs. There, it’s where the circle should be closed, where the good lifetime should never end. Unfortunately, it’s at that exact point where our current system fails more and, in consequence, our landfills keep growing uncontrollably. 2. Develop a global target and action agenda by working with all relevant stakeholders to agree on clear goal-setting and alignment with the SDGs and emission-reduction targets. 3. Translate global targets into local pathways for circular change, taking big-picture directions and interpreting these for nation states, individual sectors, supply chains, regions and cities to embed strategies in their specific context and align with incentives and mandates. 4. Improve our understanding of how different levers for circular change affect aspects such as material saving, value retention and climate mitigation. Also consider fully the dynamics of international trade and employment, plus implications for education, training and future skills, both for young people today and the next generations of tomorrow. To prevent the high damage our current system is inflicting, not only to our planet but for future generations, closing that gap isn’t lesser than crucial. “Our linear model is effectively no longer fit for purpose, failing both people and the planet,” they stated in their report, which also praise that our best shot is “the transition to circularity,” that has to be seen as “a means to an end.” “As a multi-stakeholder model, a circular economy has the ability to unite a global community behind an action agenda, engaged and empowered both collectively and individually. Its systemic approach boosts capacity and capability to serve societal needs, by embracing and endorsing the best humankind has to offer: the power of entrepreneurship, innovation and collaboration,” they said. In fact, the Circular Economy is more than just recycling old devices, it is about undertaking a complete social and cultural change, which will be ultimately reflected on how we understand natural resources and how we make the best use out of them. Shifting to that mentality, the very beginning of our thinking, will make us take, make, and reuse differently. And hence, contribute to create a new economy out of that new paradigm. However, that change can’t be done individually or through limited efforts. It needs global support from every layer of our society, all key players need to take part of it and work in cooperative ways. 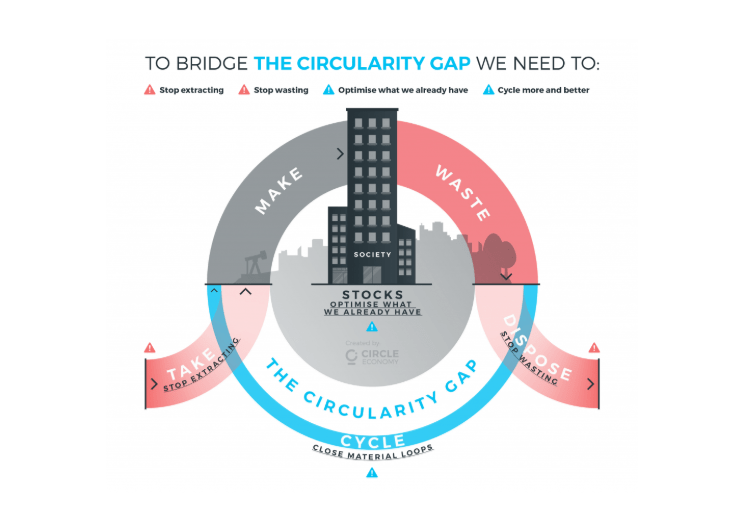 The first step, again citing the report, might begin for closing the circularity gap.